Ahhhh, keping us on our toes again with B&W. Rot....agreed. Has to be shades of gray. It's a pumpkin funeral. 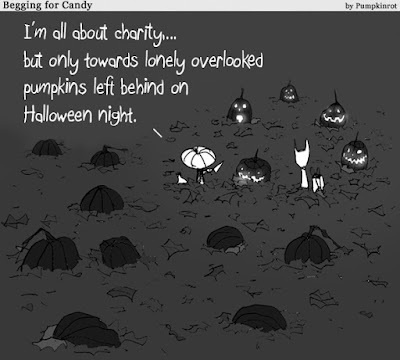 Quite honestly I never carve the pumpkins I grow although I give most of them away and they are carved by others. I want them to last as long as possible...often part with them the following spring. every year, we collect all the thrown out jackies from the trash (on our street) & put them on top of our fence in the yard & let them live out the rest of lives to the fullest. i LOVE looking at them from the windows too. then..we finally take them up to Whole Foods for the compost.